Are you getting the most from your training and nutrition? You're likely not, and it's largely due to modern living. Contemporary man is rather impressive with all our amazing creations: architectural wonders like the Coliseum in Italy, cars, computers, the Internet, hot sauce, fried chicken and, of course, mixed martial arts. But modern life has a huge impact on our health and athletic performance. Consider the exposure to numerous chemicals that include pesticides, antibiotics, radiation from phones and computers, and then think about all the additives in food readily available today. Couple this with the minimal amount of time spent exposed to the radiation we need, that little thing called sunshine, and you can start to see where some of our problems arise. 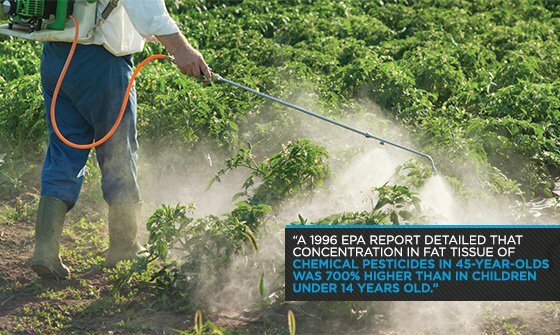 A 1996 Environmental Protection Agency report detailed that concentration of chemical pesticides in fat tissue of 45-year-olds was 700 percent higher than in children under 14 years old. That is a pretty substantial accumulation of damaging toxins through normal living—and in 2013 we are exposed to these factors on an even greater level. One of our biggest considerations is the altered state of the food chain. Animals are not developing in their natural conditions, at normal rates of development, or eating naturally occurring foods. In turn, this affects the nutrient content of our food. For example, a grass-fed cow produces meat that is rich in omega-3 and linoleic acid, but its grain and beef tallow-fed brother does not. This is a consistent issue throughout large parts of our food chain, ultimately due to the financial and volumetric demands on food production. Vegetables and fruit are grown on different continents, then cold-stored before spending a week or more on a ship, which begs the question: Does an apple really give you what you think it does? 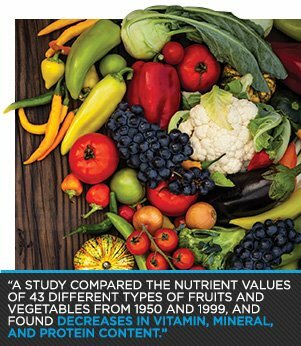 A study in the Journal of the American College of Nutrition compared the nutrient values of 43 different types of fruits and vegetables in 1950 and 1999, and found decreases in vitamin, mineral, and protein content. The fruits and vegetables had less calcium, phosphorous, iron, riboflavin, ascorbic acid, and protein. They found that broccoli, for example, had 37 percent less calcium than it did 50 years ago, and winter squash had 52 percent less riboflavin. In contrast to us, our ancestor—the caveman—was out hunting and foraging for food. He ate smaller quantities of meat, but of a far better nutrient profile, as well as roots, nuts, and berries. He then had a diet rich in vitamins, omega-3, lipoic acid, zinc, magnesium, and l-carnitine from quality meat, raw vegetables, and regular exposure to sunlight for vitamin D3. Funny enough, modern diets are typically lacking in sufficient quantities of each of these. Even when we consume a good, clean diet with red meats, fish, poultry, vegetables, and fruits, they are often still left requiring additional supplementation. The requirement for these becomes greater when you are performing regular physical exercise. 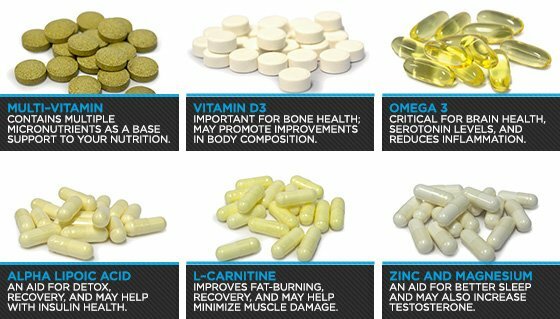 Supplementing these key vitamins, minerals, and nutrients will ensure more adequate levels of each. This, in turn, assists our base nutrition and gives us a far better chance of achieving optimum performance.